We hoped you liked reading Is Ichiro Declining? by Peter Bendix! 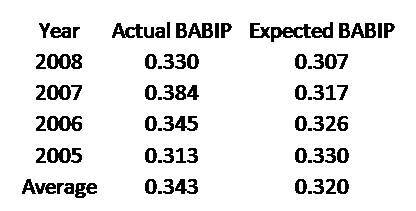 Great job on your new BABIP model – it is a very interesting and intriguing one. I am a bit statistically-challenged however, and need help using your x-BABIP figures to predict actual batting averages for 2009. I realize that I will need estimated K%, BB%, and HR% to do these calculations, but can you help me figure out how to do the actual calculation using those estimates? Well, the 30 minutes or so that I spent trying to figure out a viable formula for estimating actual avg. based on BABIP may have been in vain, but at least it’s not indicative of gross statistical oversight on my part. : ) Thanks for your reply, Peter.